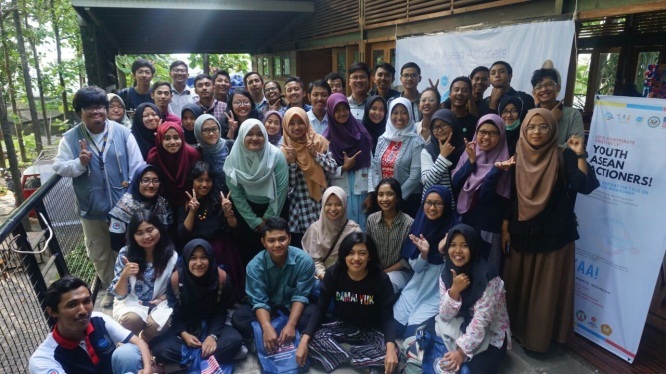 The day on Saturday, December 9, 2017 Young Leaders Initiative of Southeast Asia (YSEALI) cooperate with Gather Community ODD and Yogyakarta merit 50 participants from different communities and individuals to participate in the “Social Innovation Talk on JogjaSDGs Workshop” in Asean Youth Action Projecter (YAA), I represent Yayasan Rumah Impian Indonesia. The theme of this activity is “Social Innovation in Building Local Communities Toward Sustainable Development Goals” in order to develop action plans and link various early Sebai youth communities early to locate the United Nations SDG in Yogyakarta. In half a day, we have a good lesson. First speaker Kartika Dewi Ayu brother of SabangMaurake, exposing the material with really impressive and so integrated in Benah. The most important part of the material is design thinking, I can not just forget it. Design Thinking consists of 4 stages, including (1) How could we, we must first formulate the question of what inspires us to do something for our environment. In this section, we are divided into two people in each group and begin to wonder why SabangMarauke wants to do the action (this is an example). It really sharpens the brain for thinking, and the questions that are asked are not necessarily appropriate, but that early learning goes to the next level. (2) Brainstrom, in this section we are invited to put forward unreasonable ideas that submissions will find a solution for our actions. The concept in this section is that we give the idea of ​​big or small things, so our idea is smaller to the point if it has found a solution. (3) Theory of change, result of the brainstorm that we formulated in the If statement. . . ., Then. . . . . and that’s why. . . . . (4) Elevator Pitch, unfortunately, we do not practice for this part, but it is the most important part of a community. A statement that speaks of our community and should be delivered in just 30 seconds, when we meet people in the elevator or when we meet influential people. This part is very important to give an impression on our community and for a moment I wonder if Rumah Rumah Impian Indonesia already has Elevator Pitch? The second speaker was Cahya Wulandari who explained the local development and organization. As soon as possible, we were made to understand how to build the local community and how to involve all groups in the region, especially with regard to the approach was described in detail, which we need to first come meet and participate in the community itself. And in the shortest time, too, we have been divided into groups to be one of the community and to take part in seeing the potentials, problems and solutions should offer us, as well as presented directly. 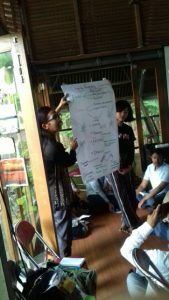 In addition, there is also an ODD material explanation on the future Jogja ODD 2025 and 2030 and also Satunama to know the community and the more this activity is covered by a concrete action plan as a solution to the problem of Yogyakarta.